Bruce who? That's exactly how I felt just a few days ago, until I browsed the US PADI Instructor blog and found a post on Bruce Mozert in there. That was an eye opener! The short version; he is the pioneer of underwater photography. If you enjoy this part, have a look part 2 for some more pix by him. As Mozert puts it, he “took to photography like a duck takes to water.” For the man generally considered the “grandfather of underwater photography,” that may be something of an understatement. On the scene at Silver Springs in 1938 to capture the third in the Tarzan series starring Johnny Weissmuller and Maureen O’Sullivan, Mozert was vexed to discover that the one shot he truly needed, Weissmuller swimming with “porpoise-like grace” in the springs’ crystal clear waters, was the one shot he couldn’t get. That’s because the only way to capture underwater sequences was in a submerged drum outfitted for the movie’s cameraman, and there wasn’t room enough in the rig for Mozert. But, in what would become Mozert’s lifelong mantra, necessity proved to be the mother of invention. He got permission to nose around the park’s maintenance shop and cobbled together the world’s first underwater camera casing out of galvanized metal sheeting, an old inner tube, and rubber cement. He ended up with black-and-white images so good that MGM snagged them for publicity stills, paying Mozert the princely sum of $12. 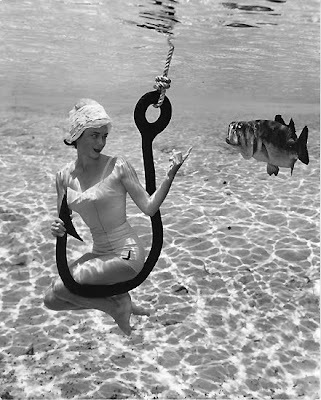 IN THE PRIMORDIAL days before Disney, Silver Springs became Florida’s premier tourist attraction thanks in large part to a public relations juggernaut that targeted snowbirds through release of thousands of publicity stills on the national wire services. Mozert was part of an aggressive marketing machine that by the 1950s saw annual visitation of 800,000. 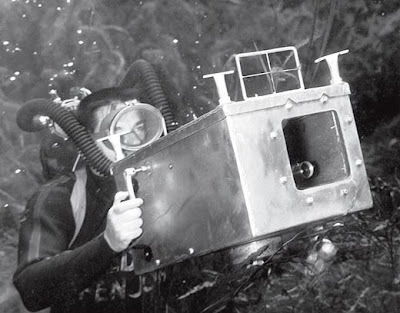 During the park’s heyday, from the 1940s through the early 1970s, Mozert’s pioneering efforts resulted in the first underwater movie camera and the first underwater lighting system that is still used today. TO PROMOTE SILVER SPRINGS, Mozert knew his photographs had to be “snazzy” enough to grab attention from the press and would-be tourists. 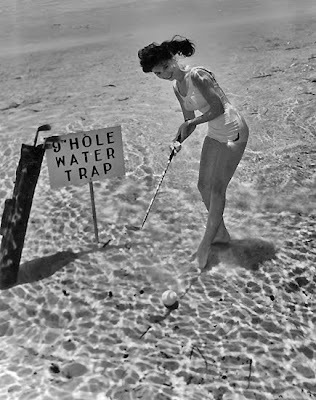 To accomplish that, he used shapely models performing everyday tasks such as smoking cigarettes or drinking Cokes, flipping burgers on a grill, playing golf, or cooling off in front of a new-fangled air conditioner—all underwater. He continued to refine his housing designs for both still images and movie cameras. 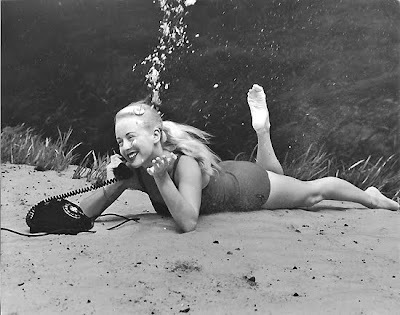 Mozert shot all the underwater footage for the Creature from the Black Lagoon, and worked for all of the major television networks, including ABC Sports, NBC’s Mike and the Mermaid, and CBS’ Sea Hunt. For 15 years during the 60’s and 70’s he was a contract photographer and cameraman for Mercury Engines. Shooting high speed underwater footage of propellers is a feat that he is particularly proud of. 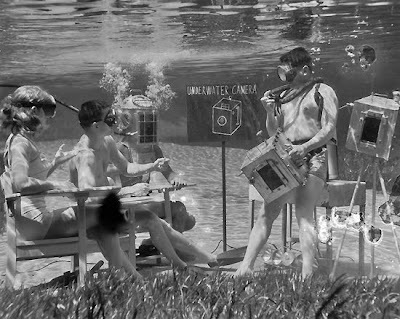 Mozert’s legacy is the series of unique underwater images of beautiful models in real-life domestic situations under the crystal clear waters of Silver Springs. His images are world class examples of conceptual photography at its best. For forty five years Bruce Mozert developed impactful and memorable images that not only required creative prop work, but early on required inventive experimentation with homemade housings and lighting systems. In fact some of Mozert's early underwater rigs are on display at museums around the USA like the Smithsonian. He began shooting underwater before the invention of regulators (the “aqua lung” as he refers to it), and explained how he would submerge in a diving helmet tethered to a hose at the surface with people pumping air by hand. Eventually he recommended attaching the hose to a compressor and essentially invented the first compressed air system. These were the days prior to navy dive tables and an understanding of dive injuries like embolisms. He reflects back on a few situations where he had to perform an emergency ascent and in retrospect is lucky he didn’t embolize. We should all be just as happy that he didn’t as we all owe Mozert credit for helping to bring the modern era of underwater photography to fruition. Keep your eyes peeled to this blog for more pictures of Bruce here shortly!